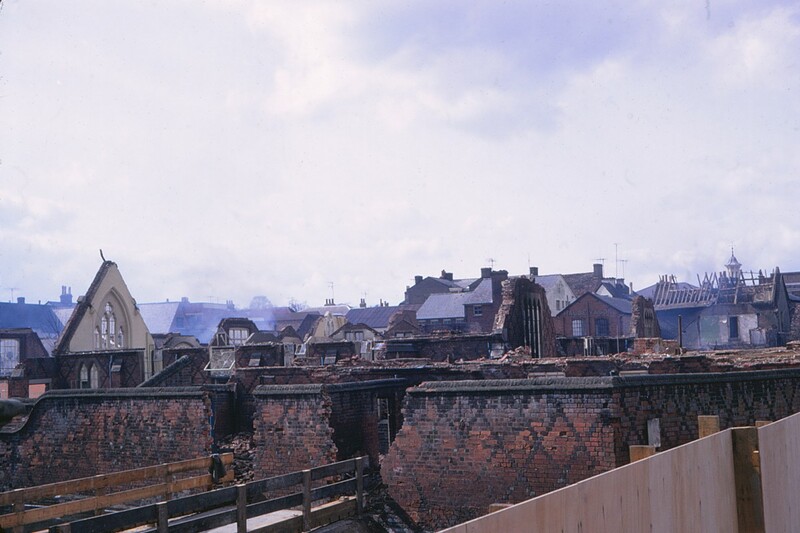 These are my fathers slides of some demolition work being carried out in Hitchin in 1971. This page was added on 15/08/2011. Definitely St Andrews School – recognised by the diaper brickwork bond, but it was built as St Marys National (CofE) School in 1854. Known as St Marys through WW2 but at some time between WW2 and demolition (which might be earlier than 1971) they changed the name. The original St Andrews School was at the junction of Hollow Lane and St Andrews Place, also built 1854. The current St Andrews is in Benslow Lane. The lower photograph is of the area currently (2012) covered by the market: the Biggin is off the picture to the left and St Mary’s Square Car Park off to the right. We are looking towards where Churchgate now stands and the photograph was taken from where the public toilets would be built. The upper photograph appears to show demolition os structures of Biggin Lane: the church-like building was presumably part of St Andrew’s School. It shows a similar view to the lower photograph, but before the demolition was completed. You can see the bell-tower on the Corn Exchange in both photographs. The first picture may show the area behind the old Methodist Church on Brand Street. 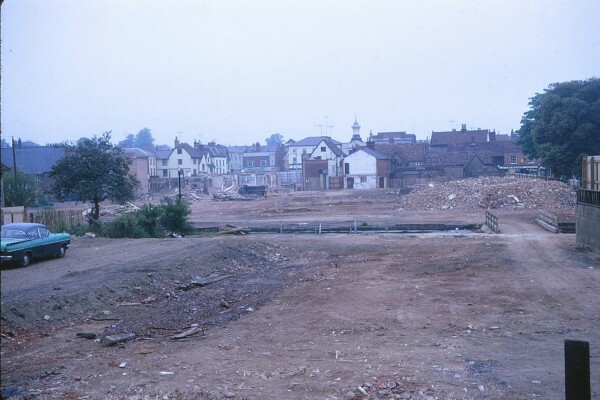 The second picture may be the area behind Brookers before the flats were built. Emily Davies, Suffragette & Founder of Britain’s First Women’s College. Hitchin's High Street: a 1911 snapshot.